For serious Fantastic Four collectors, it doesn't get much better than this: a killer, high grade NM- copy of FF #6 with WHITE PAGES. This is a beautiful sample and looks like a 9.4 (take a look)!! The corners are nice, the colors are brilliant and you can tell this was a well cared for and properly handled treasure from a serious comic collector's stash. 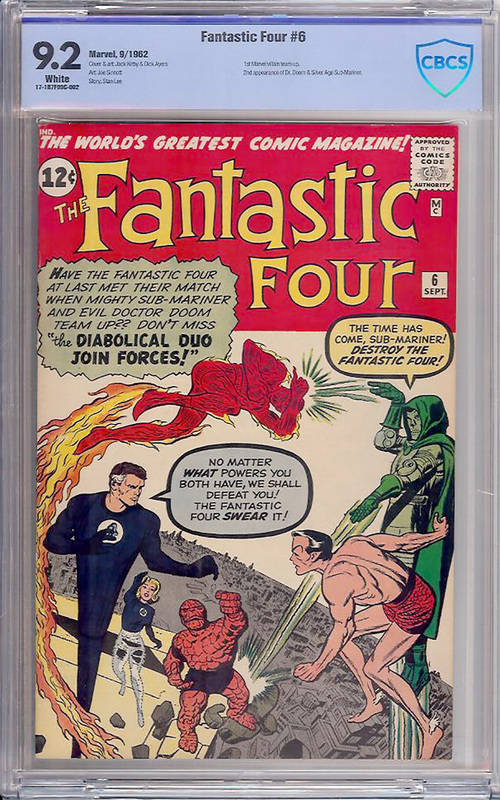 One of the tougher early FF's to find in grade (only 2 in 9.6 and 6 in 9.4 certified higher and there has been no additions to the 9.6 or 9.4 totals in over 3 years) and it features the first villain team-up in Marvel's history as well as a great Doctor Doom/Sub-Mariner cover by the King. Has always been one of the tougher early FF issues to find in high grade and this is only the second 9.2 we have ever had for sale.